It was at Snooze that I did something very un-unvegan. For some reason I just couldn’t take my eyes off of their OMG! French Toast, which had a name that bothered me, but ingredients that lured me in. 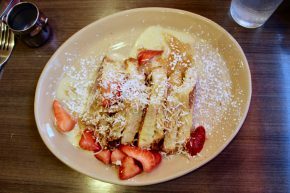 This french toast was stuffed with mascarpone, then topped with vanilla creme, salted caramel, real strawberries and toasted coconut. It was like dessert for breakfast and it was all mine. Well, sort of, as I worked out how to split this and still get something much more unvegan. A couple things on the side. That second dish was the Chilaquiles Benedict. 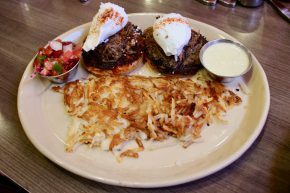 Riding on the wave of my enjoyment of the barbacoa benedict at Eggstasy, this also had barbacoa, but came on top of ranchero sauced tortillas, with roasted poblano hollandaise, cotija cheese and pico de gallo. We ordered with the pico on the side for me and the hollandaise on the side for the wife. We also got some hash browns. These dishes were the best of both worlds, with the french toast fulfilling the need for sweet, but not overly so. Then the benedict came in and brought some amazing savory flavor to the mix, with nicely seasoned (although kinda sparse) barbacoa, some nicely poached eggs and a twist on hollandaise sauce that displayed Snooze’s sense of creativity. I can see why Snooze had a line out the door, but I also felt that it was a good spot to try once assuming that line is always there. I know I’ve said it before, but there are just too many breakfast spots in the Phoenix area to limit yourself to just one.